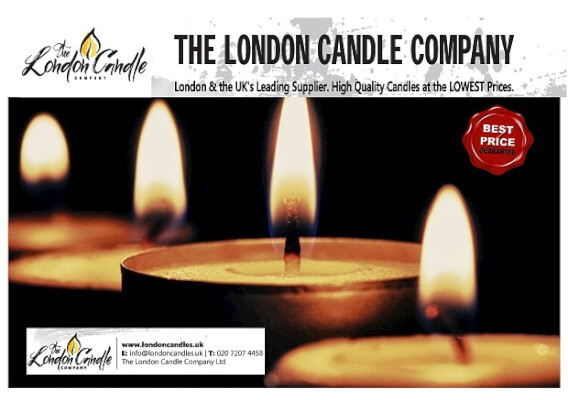 The London Candle Company is the UK’s leading candle specialist. We supply top quality candles in bulk at the lowest UK prices. Our candles are manufactured in Germany to the highest specifications, they are long burn and of the highest quality. Deliver for FREE on orders over £50 & next working day (orders received before 12pm). Pride ourselves on our excellent stock availability. Guarantee high quality, German manufactured candles at the LOWEST UK PRICES. Bulk Buy & Group Purchase Discounts Available. The London Candle Company supply the full range of candles, candle holders, paraffin lamp oil, liquid wax candles, outdoor products and battery LED candles. Visit our shopping page here. If you can’t find what you are looking for please email us: info@londoncandles.uk or telephone 020 7207 4458. We look forward to working with you. Please contact us sales@londoncandles.uk with any suggestions to help us continue to improve the way we do business while protecting the environment. Please call us on 020 7207 4458 in advance so we can make sure we have the stock available at our London office (our warehouse is near Manchester). The London Candle Company Limited, 9a Kitto Road, London, SE14 5TW.